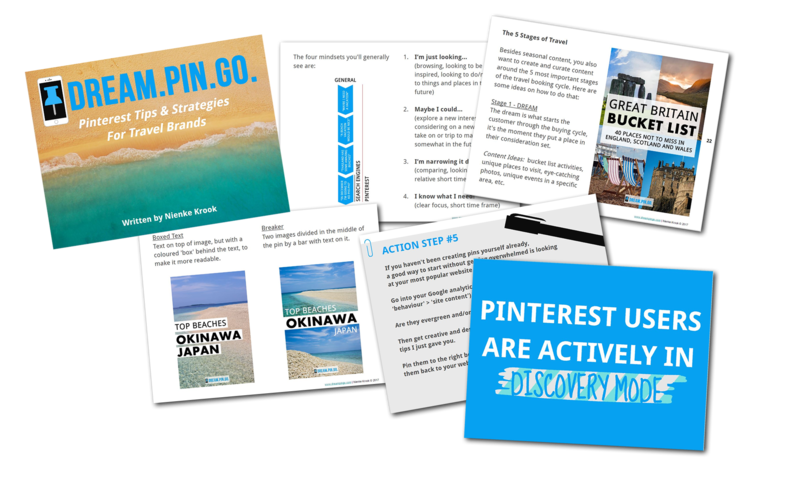 Pinterest Strategies for Travel Brands | Ebook Dream.Pin.Go. Every day, millions of consumers are on Pinterest to explore their interests, get inspired, find practical tips and even purchase goods directly from the platform. And while you probably already heard from someone that Pinterest can provide great value for your business, you just haven't gotten around to sit down and look into 'yet another' social media channel. Or maybe you have looked into it, but you just don't quite get it. You pin content all the time, but don't think it helps. You get frustrated to hear others saying it drives lots of website traffic, while your own account barely gets traction. The good news is: you are not alone. In my experience using Pinterest for business since 2012, I've found that most most people find it hard to see how, besides being visually appealing, Pinterest can provide any practical, systematical use to boost their business. Whether you're a destination marketeer, tour company, travel service provider, blogger or any other business with readers and customers looking to explore the world, this mini-course is made for you. In clear, step-by-step instructions, I will take you by the hand and help you get started with Pinterest. Jump-started, really, because by using a specific content strategy from the beginning, you will see both immediate results as well as long term benefits all within the same effort. Sign up today and receive this course for the lowest price it will ever be. And best of all: you get lifetime access to this mini course. So even when the price goes up (and it will, because I will be updating and adding content as changes on the platform roll out), you get all updates for free. Tell me: Are you up for the challenge? In 12 Chapters, I will take you through the entire process of setting up, optimising and maintaining your Pinterest profile. 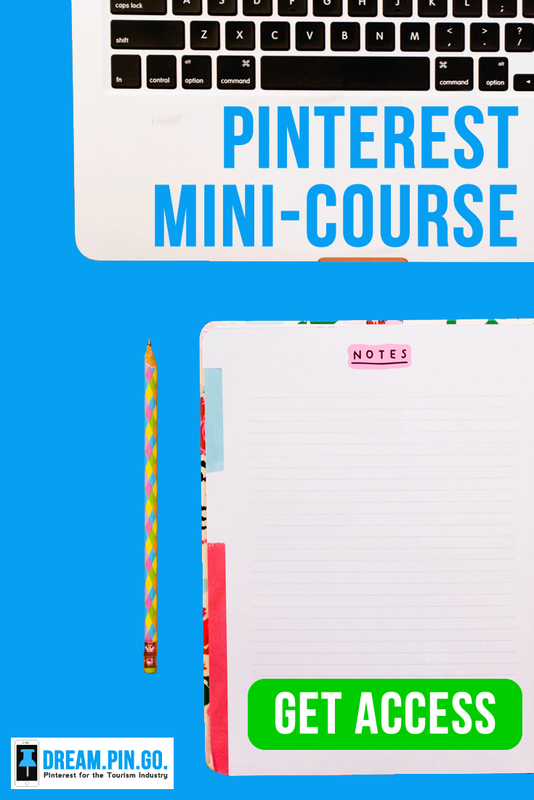 And last but not least, we will CELEBRATE everything that you learned by providing you with a list of all tools and an action plan to get your Pinterest account growing even more in the future. Besides a downloadable .PDF file of the entire book (180 pages! ), you will be able to go through each page individually and mark your progress as you go along. Each chapter consists of easy to understand theory, an inspiring quote, step-by-step instructions, as well as practical action steps and illustrated examples. As a bonus, you will receive a 7-page Tool List with links to everything you might need to make your Pinterest efforts a success this year. Furthermore, there are a number of bonus chapters which include tips and advice on Pinterest Etiquette and Copyright. Scroll further down on this page to see the complete overview of chapters in this course. My name is Nienke Krook and I've been hooked on Pinterest ever since the launch of the platform in 2010. After two years I started using Pinterest for my own travel blog The Travel Tester and since that time I've nurtured my account to over half a million unique followers. I am the founder of Mappin Monday, a travel community with the biggest collection of quality travel content on Pinterest. Besides our group board, we have an active Facebook group where we share tips, best practices and the best travel pins on Pinterest. We'd love for you to join as well! Through my company Dream.Pin.Go. I give bloggers and businesses in the tourism industry tips and advice on growing their influence on Pinterest and driving traffic to their websites. This involves everything from account management, workshops and public speaking, to simply answering your questions in person during the many blogging conferences and trade shows I attend each year. Come and say hi next time! As you can tell, I am very exited about this visual bookmarking platform called Pinterest and my aim is to not only get you excited about it as well, but show how it really can make a different to your business. Let's go and make your life a little bit more Pinteresting today. A Whole Lot of Extra's for You!